Every wondered what it would be like to hunt Nepal? 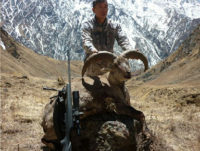 All outfitters in Nepal, conduct hunting in the Dhorpatan Hunting Reserve. The hunting reserve is spread over an area of 1325 sq.km and consists of 7 blocks. These blocks are given out each year to outfitters that hold a license to hunt in the reserve. There are two hunting seasons, Spring Season – March and April and the Fall Season – October and November. Not all of the blocks have Tahr in them, where-as Blue Sheep are present in all blocks except in the Surtibang block, which just has Tahr. Because the quota for a Tahr license has been decreased by the National Parks and Wildlife to just a few per season, there has been increased bidding by Outfitters for a tag, resulting in a significant price increase. Often Tahr tags are given for different blocks than Sheep tags, a hunter may find himself having to Trek down about 4 or 5 days in or- der to get to the Tahr hunting areas. Depending on a lot of factors like weather and fitness of the hunter a Sheep hunt usually takes 3 days on an average and a Tahr hunt similarly will take 3 days. The other days of a hunt are needed for the trek from one Sheep camps to the Tahr camps and the trek out, making this hunt a 2 week hunt. However with the new development of the Government giving Tahr and Sheep licenses in different blocks, this hunt may increase to a 3 week hunt. A sheep hunt in Nepal finds the hunter being followed by a long line of nearly 30 people consisting of Sherpas, porters, local guides, community personnel, hunting reserve personnel, cooks and skinners carrying loads inside wicker baskets, in order to take tents and food for the hunter to high altitudes, this could be the only country in the world where the old world charm, reminiscent of the snaking lines of porters on a safari in the African sub continent, can still be experienced. Helicopter charters are expensive and start and end in Kathmandu. Depending on which block one is hunting, the helicopter lands on an average of 3200 meters for the Sheep hunt, from where the hunter will need to walk at least another 2 days to reach Sheep Base Camp in order to acclimatize. 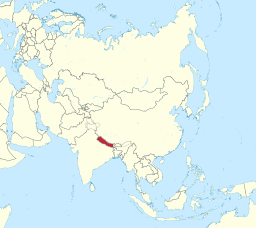 Arrival and Departure is from Katmandu’s Tribhuvan International Airport, with connecting flights from Europe, Africa, North and South America.